It is commonly known that Spanish is an important source for terms and expressions that have made their way into the English of the southwestern United States. Indeed, books that examine the history of the western United States or the history of United States English frequently provide a sampling of such terms. 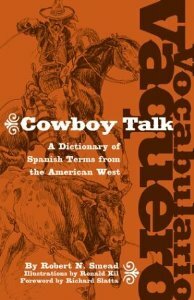 Vocabulario Vaquero/Cowboy Talk is the first book to list all Spanish-language terms that pertain to two important activities in the American West--ranching and cowboying--with special reference to American Indian terms that have come through Spanish and were probably known to cowboys and ranchers. In addition to presenting the most accurate definitions available, this A-to-Z lexicon traces the etymology of words and critically reviews and assesses the specialized English sources for each entry. It is the only dictionary of its kind to reference Spanish sources, providing for ease of comparison between the host and source language forms and definitions. The scholarly treatment and breadth of this volume make it an essential addition to the libraries of linguists and historians interested in Spanish/English contact in the western United States. Western enthusiasts (writers, composers, or students) will find the work to be accessible and full of invaluable information.